Kimpton Hotels & Restaurants has announced its first-ever Toronto hotel – Kimpton Saint George – which will open in the summer of 2018 in the city’s downtown Annex neighbourhood. Located at 280 Bloor St. W., between Huron and St. George Streets, the hotel is now taking reservations for stays commencing 1JUL. 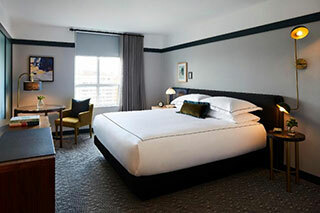 The 14-storey Kimpton Saint George will feature 188 guestrooms, including 20 suites, a presidential suite and approximately 1,500 square feet of ground level meeting space. Amenities will include a fitness centre, complimentary PUBLIC bikes, in-room yoga mats, pet-friendly accommodations, complimentary morning coffee and tea service and hosted nightly social hour. Additionally, a soon-to-be-announced restaurant, located adjacent to the hotel, will service in-room dining and catered events.